With 2009's Moon and 2011's Source Code, director Duncan Jones gave us two refreshingly clever and original sci-fi thrillers, winning the admiration of audiences and critics alike. It's not understatement, then, to say how surprising it was when Jones signed on to direct the movie adaptation of blockbuster video game, Warcraft. Whatever you thought about that movie, Jones' talent for brainy, entertaining science fiction is undeniable - lucky for us, he's returning to the genre with Mute, a new original film for Netflix. The movie, having commenced principal photography this week in Berlin, packs a hefty cast, with Alexander Skarsgård, Paul Rudd and Justin Theroux starring. It will follow Leo (Skarsgård), a mute man searching for a missing person in the year 2052 in Berlin while dueling with two rogue villains played by Rudd and Theroux. Jones started developing the story twelve years ago and co-wrote the script with Michael Robert Johnson (Sherlock Holmes, Pompeii). 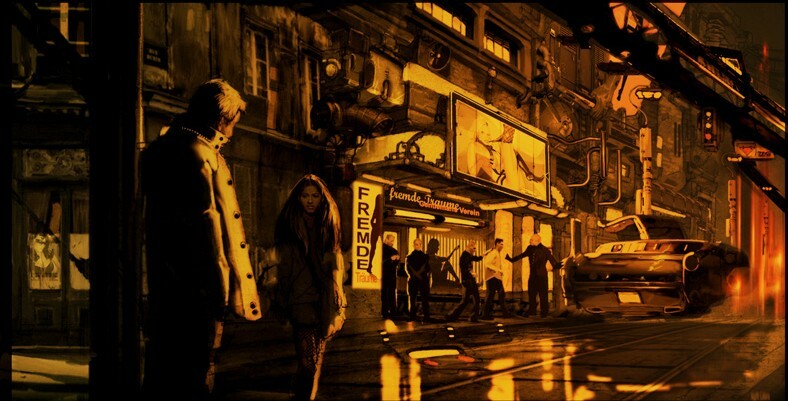 Jones has also been working with Dark Horse comics and Glen Fabry on an accompanying graphic novel, some of the concept artwork for which can be seen below. Talking about the project, Jones calls it "an encapsulation of everything I am fascinated by; noir, science fiction, and unique people in trouble because of who and what they are. I’m delighted to be able to return to Berlin for the shoot, a place I lived for a period of time growing up, and I’m excited to be working with Netflix on a film that is so close to my heart." Any mention of 'noir' and 'science fiction' in the same sentence naturally brings Blade Runner to mind. With such a whopper cast and unique talent behind the camera, Mute looks to be just as original and entertaining as Moon, which was easily one of the best sci-fi movie of its decade. Apparently, both movies are set in the same cinematic universe - whatever that associaiton will produce, its certainly an exciting idea!